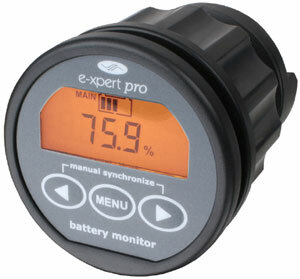 The e-xpert pro selectively displays battery voltage, charge, and discharge current, consumed amphours, remaining battery capacity and time remaining. Using a large clear backlit LC Display and an intuitive user interface, all parameters can be recalled with just a button press. The e-xpert pro replaces the industry standard e-xpert 501 and adds many innovative features like a second battery input, a shunt selection feature, storing a wide range of history events and extensive alarm relay programming. The potential free alarm enables you to run a generator when needed or to turn off devices when the battery voltage exceeds programmable boundaries. The e-xpert pro is easy to install and operate and comes standard with a high precision 500 Amp shunt and a very clear installation and operating instruction manual. The e-xpert pro can be used with voltages ranging from 0-35V. 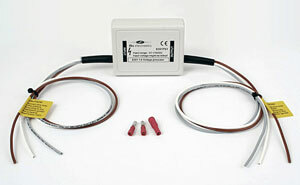 However, with our voltage scalars, it can be used with higher voltages. The 1:5 prescaler allows it to be used with voltages up to 175V and the 1:10 prescaler permits it to be used with battery packs up to 350V, more than an adequate range for electric vehicle purposes. There are 2 ways to get an exact quote for the base shipping for your EV-Pro LV Digital Battery Pack Monitor order. We’ll research the exact shipping cost and send you an invoice to your PayPal or email or you can add it to your pallet in $1 Shipping Increments for your EV-Pro LV Digital Battery Pack Monitor order.